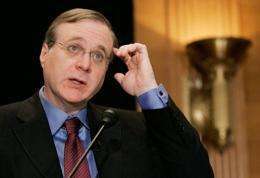 Microsoft cofounder Paul Allen, pictured in 2006, on Tuesday announced plans for a new space travel system that would use the largest airplane ever built to launch rockets carrying cargo and eventually humans into space. Microsoft co-founder Paul Allen and aerospace pioneer Burt Rutan are building the biggest plane ever to haul cargo and astronauts into space, in the latest of several ventures fueled by technology tycoons clamoring to write America's next chapter in spaceflight. Allen, who teamed up with Rutan in 2004 to send the first privately financed, manned spacecraft into space, said his new project would "keep America at the forefront of space exploration" and give a new generation of children something to dream about. "We have plenty and many challenges ahead of us," he said at a news conference. Allen and Rutan join a field crowded with Silicon Valley veterans who grew up on "Star Trek" and now want to fill a void created with the retirement of NASA's space shuttle. Several companies are competing to develop spacecraft to deliver cargo and astronauts to the International Space Station. "When I was growing up, America's space program was the symbol of aspiration," he said. "For me, the fascination with space never ended. I never stopped dreaming what might be possible." Sir Richard Branson's Virgin Galactic licensed the technology and is developing SpaceShipTwo to carry tourists to space. The new plane will have a wingspan of 380 feet - the world's largest. The plane will carry under its belly a space capsule with its own booster rocket; it will blast into orbit after the plane climbs high into the atmosphere. The company, to be based in Huntsville, Ala., bills its method of getting to space as "any orbit, any time." Rutan will build the carrier aircraft, which will use six 747 engines. Allen left Microsoft in 1983. Since his time at the software giant he has pursued many varied interests. He's the owner of the Seattle Seahawks football team as well as the Portland Trailblazers of the NBA. make the engines electric, coat the entire wings structure with solar cells to power them, and take off from a sunny desert, and make the cost per launch even cheaper. Paul, do a bit of math with the solar constant. Seriousy. Well, if they stick to their schedules as well as spaceship 2 has, we might see a test flight sometime around 2025-2030. Your cells would provide enough power for cabin systems. Maybe. paul i think you are underestimating by factors how this thing will need energy. after the duration of a sneeze when then the batteries run out, this behemoth still has to fly and its NOT a glider! Assume this large plane can go to 45,000 ft at 600mph. turn on the rocket motor (fed from the plane) and keep it running until the planes supply of rocket fuel runs out. This addition of the rocket motor may substantially increase the speed and/or height at release. If the plane is too high for its engines it can glide back into the atmosphere until its engines can be used. Wait, I need to go join the Democrat supported and encouraged, get rid of the 1%, unwashed, defecating in the street Occupy nuts who are trying to block the ports so I can't get my imported shipments in, which if successful would create jobs, reduce unemployment, increase the wealth of my employees and hopefully myself. BTW, isn't Paul one of the 1%? The government should have taxed everything he had so that he could be like most of us. There is no reason for someone to be as rich as he is just so that he could afford to build a spaceship, possibly making space travel affordable, create high tech employment, etc. Suresh: It's too long an explanation for this post, but sorry, that won't work. Freethinker: I hope he succeeds as well. If Allen, Musk and Rutan et al can build an orbital system privately by 2016 for less than NASA or UAL, they will save this government a bunch of money, speed up the settlement of space, end UAL's monopoly, and make it easier (?) for civilians to go into space. Not all 1% ers support the current GOP goals, and not all 99% ers support Obama's. That's what makes a horse race. This should work fine-it's basically a Pegasus rocket on steroids. "freethinking", way to derail the comments thread! Anyway this is great, the first half of the article I kept thinking "please don't be just a suborbital space plane, come on don't do this to me" :) I'm glad to see my pessimism was unfounded! The image of the twin-fuselage carrying a rocket in the middle is very powerful, this could turn out to be a symbol of a new space age -- I hope it does! How much money do they plan on making on this? I don't know anyone who can afford a ticket, honestly. This thing is bigger than the Spruce Goose. It's like something you used to see in science fiction or a video game. I guess solving anti-gravity problem out of question. I remember back in the day when Branson announced that they will start taking passengers up by around 2008 hahaha I hope we don't have to wait as long for the first passenger flights as we have for Diablo 3 to be released. Great timing, make it from "shrilk," a new material reported on the same day as this project! I doubt this will be any cheaper than good old launch pad. I do hope it will be, tough. I would turn on the rocket motor (fed from the plane) and keep it running until the planes supply of rocket fuel runs out. This addition of the rocket motor may substantially increase the speed and/or height at release. Indeed: It would require a design change. STiffer airframe; change wingshape/aerodynamics; thrusters, on wingtips and fuselage for attitude control; ablative coating for re-entry heating; APU's just like the Space Shuttles;Better autopilot and remote control from ground for backup, etc, etc, etc...hey! Get in touch with these guys why don't you?! A supercritical swingwing combination..? The planes lifting ability would have to still get it to 45-60K feet B4 rockets came on & with D added fuel, top out/drop at 200-300K feet. Not bad, Do it! The Russians have plane designs of appropriates size that unfortunately never left the drawing board due to the collapse of the Soviet Union. One design would have used the existing 6-engine Antonov 225 to lift a spacecraft into the stratosphere after which a tripropellant engine would send the spaceplane into orbit, using kerosene at low altitude and hydrogen at high altitude. Apart from the fuel tank, the spaceplane would have been reusable. So Rutan is where the Soviets used to be in the late 1980s. Addendum: In the late 1970s, I wondered why NASA did not try to use a wide body aircraft in a "twin Mustang" derivative configuration to lift the S 4B stage of Apollo heritage into the stratosphere. It might have needed two of the J2 engines instead of one, but it would have been an almost-SSTO using an aircraft as first stage. Of course, by that time the decision-makers had a deathgrip on the Space Shuttle project, which turned out to be a white elephant. As I said I hope this project succeeds. If it fails (and I believe it will), its not my money that was spent, technology will have been developed, and jobs created. BTW, If anyone wants to wish me a happy (put your holiday that you celebrate here) I appreciate it. Sunshine is a very dilute source of energy (750w/m2), so it is useless for this application. Scratch calculation: 6 747 engines - about 180 Mw. At 100% efficiency, that would require wings 1000 meters long and 240 meters wide. Chances of success? Rutan, Allen and Musk all have a history of making things happen. Who can afford a flight? Well, not me, but I know about 30 people that could drop a million on a ticket and would. If the booster was a reusable version of the Falcon 5, a million would be on the high side. With the skilled hand of Rutan involved I think this outlandish goose is actually gonna fly. But what about the economics? Some observers say that the payload (around 6000 kg) isnt that impressive, on the other hand i've read somewhere that some big rockets eat away up to 15 m3 of fuel a second and a standard fully loaded Boeing 12-15 liters (that would be a cube of less than halve a metre(? ), so if there is a great deal of fuel to be saved, they would need a fair number of medium sized cargo or tourists to make the initial development cost of the plane pay back, having said that I really like how they have the guts to break new ground in a risky market. -Heres to the end of religionist tyranny, a holiday worth celebrating. With the skilled hand of Rutan involved I think this outlandish goose is actually gonna fly. But what about the economics? Commercially it offers flexibility worldwide. Costs will drop based on number of units sold. but it would have been an almost-SSTO using an aircraft as first stage. The shuttle was primarily a military system - not meant to be cost-effective. Quickest to orbit, flexible, launched from hardened facilities at vandenberg afb. Which is why more rational designs such as this were not pursued. Well I hope when they launch they play the theme tune for Thunderbirds International Rescue and that TB3 won't be needed. It has to be cheaper-there is no first stage lifting the vehicle from the ground. The "first stage" is the aircraft, which will take the rocket to 45,000 feet. Reusable, too, with a turn-around time similar to any other large aircraft. Just add fuel, attach another rocket, and go. There is still first stage on the rocket. The aircraft is used as yet another stage before it. I have doubts whether this will be any cheaper than a launch pad, because it is more complex. Cost of rocket fuel is negligible, cost of this flying contraption may very well be higher. technology tycoons clamoring to write America's next chapter in space flight . . .
. . . should first become familiar with the energy source that makes things happen on Earth and in the cosmos. 4. The message  in the "Cradle of the Nuclides" overlooked. 3. "Deep roots of the global climate scandal (1971-2011)"
4. "Fear not, the universe is in good hands"
"He's the owner of the Seattle Seahawks football team as well as the Portland Trailblazers of the NBA."